The British government’s hypocrisy and double standard especially with regards to self determination, to say the least is mind blowing. It is unbelievable that the same country that is arming the Nigerian government and her military with weapons to commit genocide against the Biafran people, and extra-judicial incarceration of her own citizen (Mazi Nnamdi Kanu) could refrain from incinerating Scotland and Northern Ireland for seeking to exit Britain. One would have thought that by now, Sinn Fein of Northern Ireland and Ms. Sturgeon of Scotland would have been arrested and cooling behind bars like Nnamdi Kanu for calling for referendum so as to exit the union that has existed for decades. Just like Mazi Nnamdi Kanu whom the British has sacrificed on the altar of greed by surreptously supervising his Ordeal in the hands of the ferocious Buhari-led government for calling for referendum for the Biafran people, so are the duo above calling for independence of their unique people from the English people. The British high commission in Nigeria was quoted as saying that Britain respects Nigeria's colonial boundaries and thus will support the protection of her unity...and i want to ask , who created these artificial boundaries in the first place? Why must Britain continue to involve herself in issues concerning Nigeria if they are not benefitting from this fraud? This can be likened to a case of Britain crying more than the bereaved for constantly meddling in the affairs of Biafra for trying to extricate herself from the menace they have created. I will unequivcally say that the British has not let go off her grip on Nigeria...the 1960 independence is nothing but a hoax; this is neo-colonialism at its best. But not to derail from subject of discourse, I would like to know if there is any difference between what the Scottish and Biafrans are agitating for? Does it mean that Sinn Fein and Nicola Sturgeon are better humans than Nnamdi Kanu?....perhaps disparity in race is the big issue; but isn't it said that " what is good for the goose is good for the gander? Theresa May’s Government surprisingly has not deployed British Armed forces against Sinn Fein and Sturgeon or laid siege on Scotland and Northern Ireland for wanting out of the long existing union, just like they always ensured Nigeria adopts against Biafrans during every peaceful protest and rally for awareness creation with regards to same referendum the aforementioned entity are seeking for. Britain's open heart approach towards the duo is a slap on the face of the entire black race. It shows the thought of a white man towards affairs of African countries as opposed to “White man’s” affair. Britain believes that African leaders especially Nigerians are “animals” and incapable of reasoning; those who don’t value the lives of their citizens. I can't help but wonder what M15 or M16 is waiting for before arresting Nicola and Fein just like Kanu was arrested. How is it that Statements like “Britain is indivisible” or “Army will crush you”, and other vile comments attributed to IPOB is not ascribed to the Scottish and Irish citizens by Theresa May? This is a sharp contrast to what is obtainable in Nigeria, showing that black Africa is only good for plundering, exploitation and slavery in the eyes of Britain. The disposition of the British empire in all of these is a case of "different strokes for different folks." The leaders in England understand history and are quite aware that no country survives civil war a second time, while the animals in Nigeria are naïve of this fact due to their arrogance which stems from gross ignorance and foolishness. While those in Britain understand the futility of military action against an ideology, the savages under Buhari's command only understand “crushing” and application of lethal force to suppress Biafra agitation which ofcourse is not ending until our aim of restoring her is achieved. This whole episode is a not only a slap on the face of the black race, but a sign of ineptitude on the part of institutions that ought to represent the interest of Africans such as the AU, ECOWAS etc. How can the fate and future of Biafrans be allowed to be determined in a blood bath while that of the white man is being determined in a referendum/ round table discussion? Is it not the height of wickedness? It is indeed very obvious that Britain alongside their current partner in crime against humanity-France are in dire need of beholding a second carnage and genocide against Biafrans. If Northern Ireland and Scotland’s requests could be approached with utmost respect and regard to the UN's law on self determination, while that of Biafrans is approached with maximum force in the name of “crushing", it simply implies that George Orwen’s axiom of "Some animals are equal and not all animals are equal" is playing out here. Britain needs to eschew hypocrisy on the issue of Brexit, Scotland and Northern Ireland and possibly move in their military personnel into these various territories in order to quell their plan to "secede" just like they termed Biafrans agitation to restore her beloved nation. 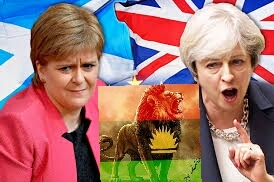 If Scotland and Ireland could desire independence due to diverse views on choice of belonging to EU or not, Biafra's premise to be independent due to perennial marginalization, exploitation, Islamization, and killings of her people supercedes theirs and deserves unwavering support from all quarters. Our case is much stronger than that of Scotland and Ireland and as such we are once again calling on men and women of goodwill especially in Britain to ask questions as to why the empire hates Biafrans so much and delight in the travails they are experiencing in the hands of murderers and savages in Nigeria especially since the tyrant, Muhammadu Buhari assumed office, while they (Britain) were allowed to have Brexit without bloodshed or single gun shot. Britain should hang her head in shame for vomiting such a hateful discriminatory about Biafra. This simply show the inferiority complex in the British government. It is now obvious to the whole world that Britain fabricated and schemed up the so called Nigeria independence. How evil of Hausa-Fulani and Yoruba to be killing Biafrans fellow West Africans with the blessing of Britain. Hausa-Fulani and Yoruba are really a disgrace. Hausa-Fulani and Yoruba is hopelessly very degrading!! !